More Than Me is a women's conference touring the nation and it's coming to Boise on January 19th! 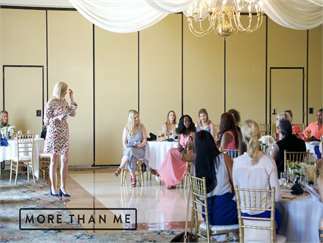 More Than Me is a movement to inspire and encourage women to step into their God-given talents and gifts through story. Come and be encouraged and uplifted through real-life stories from women who have overcome hardship, pain and who have navigated life’s most treacherous paths. We will provide tools for self-improvement, healing, and growth through workbooks and journals that help us plot out the next chapter God has already designed for your life. More Than Me is about finding the courage to say "yes" to the desires and the calling God has placed on your heart. More Than Me is about bringing women together to unite and encourage each other, facilitate new friendships and to really understand that even through our most painful or vulnerable experiences, we are not alone. There are women who have gone before you in what you're experiencing and when we share openly in our deepest struggles, we give other women permission to be open about their struggles too. So call your mom, sisters, daughters, aunts, cousins and all your girlfriends and join us for what will be an incredible and life-changing event! And if you can't think of another woman to invite, just come as you are and give us the opportunity to love you just the way you are!